Lose That Girl: HATE IT! Shoes? Hooves? Can you picture any starlet/fashionista in her right mind wearing these Alexander McQueen booties? In Paris Tuesday, models teetered along his catwalk, wearing animalistic creations -- including this unique & treacherous footwear. I like clothes and fashion as much as the next gal, but I wouldn't be caught dead doing an impersonation of a gazelle in these clompers. More often than not, catwalk stuff is meant to grab headlines and attention so in all due respect, McQueen has achieved that goal in spades. 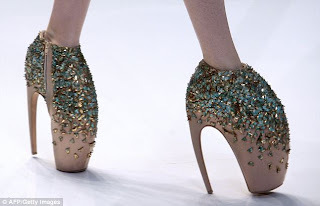 To answer my earlier question, I bet Lady GaGa (who was in attendance that night) will be strutting about in these foot pinchers very very soon. Image is everything - right? Pfft!